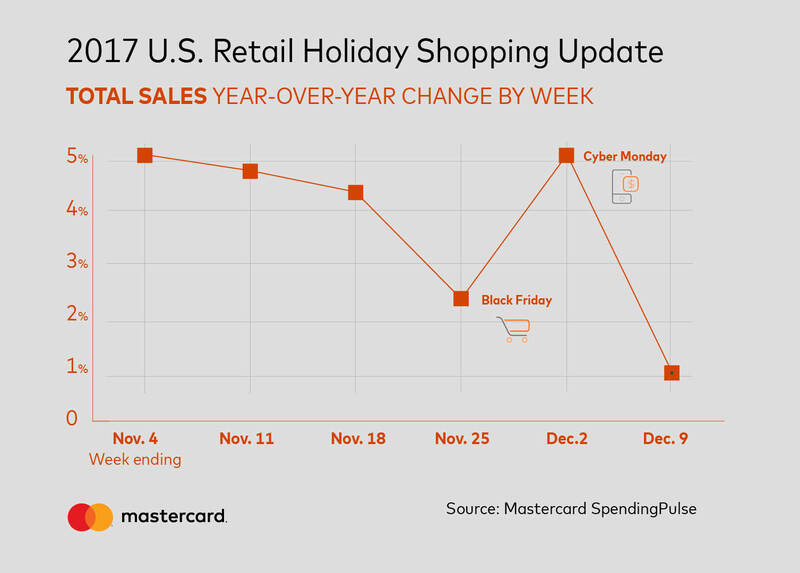 Mastercard SpendingPulse today released its U.S. Retail Holiday Shopping Mid-Season Update, reporting strong growth of 3.6 percent compared to last year. In fact, 2017 is projected to show the strongest holiday season growth rates since 2010, with the overall potential to surpass 5 percent year-over-year growth. The SpendingPulse holiday shopping update looks at retail spending November 1 through December 9.
e-Commerce sales are up 16.3 percent since November, as Cyber Week continues to find new fans. While Black Friday still accounts for significant dollar volumes, Cyber Week (Nov. 27-Dec. 3) saw higher growth this year – sales were up 5 percent compared to last year. Retailers’ heavy early-season promotions paid off, with the first three weeks of November seeing significant jumps. Those early bird shoppers were particularly spending on electronics, home improvement and jewelry, though all categories saw growth, including apparel. Home is clearly where the heart is this holiday season, with home-related purchases way up. Not only did home improvement grow 11.6 percent, but home furniture and furnishings was up 3.5 percent. “When we look at holiday spend, it’s easy to see that 2017 will likely be a good year for retailers. Unemployment is at 4.1 percent, wages are rising, consumers are confident. It is all playing out in the shopping picture this holiday season as retailers and gift recipients would want it to,” said Sarah Quinlan, senior vice president of market insights, Mastercard. Interestingly, many of these same trends are playing out across the Atlantic as well. Mastercard SpendingPulse found that U.K. retail sales saw 3.1 percent growth in November, with 12.2 percent eCommerce increases. Categories like furniture and electronics were among the big winners.